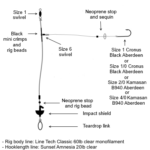 This is a great all round rig which is especially good for anglers fishing over sandy and shingle beaches. Can be fitted with size 1, 1/0, 2/0 or 4/0 hooks depending on the species of fish which are being targeted. The smaller hook sizes are ideal for anglers fishing for species such as flounder, plaice and gurnard, while the larger hook sizes can be used to catch species such as large bass, cod and rays. The hook is clipped down behind an impact shield which protects the bait as it hits the water and also makes the rig more streamlined as it flies through the air, increasing casting distances. 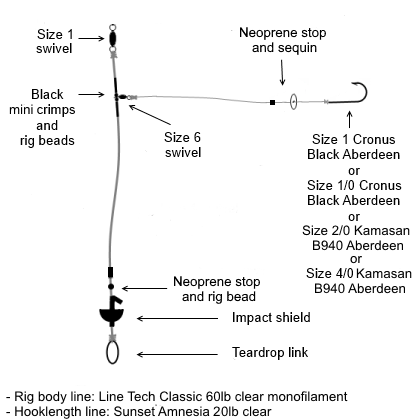 An ideal rig for anglers fishing from beaches who need maximum casting distance and top bait presentation.